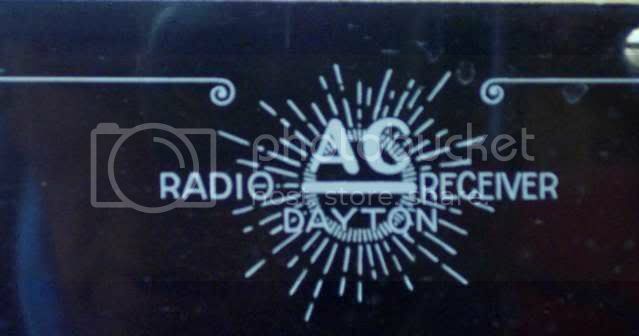 Here's the Radio Shop tag on my Meteor. And my Meteor with the Amplion Jr Delux horn. Where is the tag on your Meteor located? For some reason I don't recall seeing a tag on mine. I'll have to look this evening. I like the Amplion speaker you teamed with your Meteor. It's a nice, smaller size that seems to fit it. Where is the tag on your Meteor located? right above the center tube. horn just wouldn't look right at all. Just picked up a set very similar to the Victor. I am presuming it is home made since it has no manufacturer's label. Rauland transformers and Shamrock coils. Ive got an Early Crosley Type V. Not by any means obscure but definatly worth a mention. Its a one tube regenerative set that has a Book style tuning cap. I got mine is PRISTINE unrestored shape. Beautiful radio. Will try to get a pic out soon. from Pawtucket, RI. The picture wouldn't behave so I doctored it a bit to minimize reflections but you get the idea. It uses a Timmons Talker assembly for the speaker. I bought it with a smal Radioear loop. Wait until we get to the "Loop" thread - I'll show it to you. Actually I forgot to put it with the set. Nice "New England" built set Merrill. Hopefully this weekend I will take possession of one of the most obscure sets around. 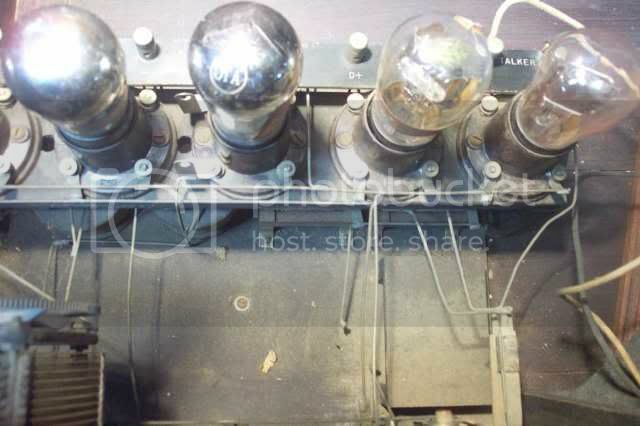 I am waiting on photos, and may have some questions that require your expertise..
Sure - - lets see em, there is always a chance its a "factory" set - - a surprisingly large number of such sets either weren't marked well or the markings have disappeared through the years. 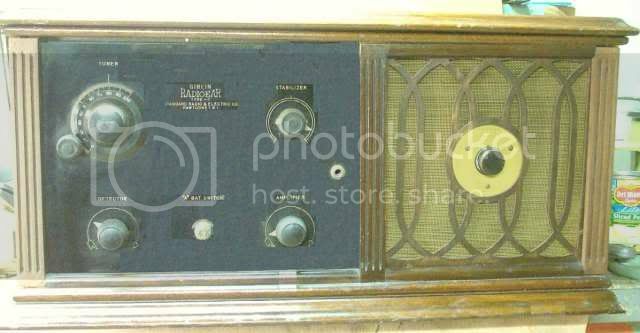 Besides we always like to see other folks radios. +1 on what Dale said. Here is one of my favorites though somewhat plain faced. This is sort of a rare bird AC Dayton R-12 which in my opinion is a real pretty set. I know of only one other and that is in poor condition. 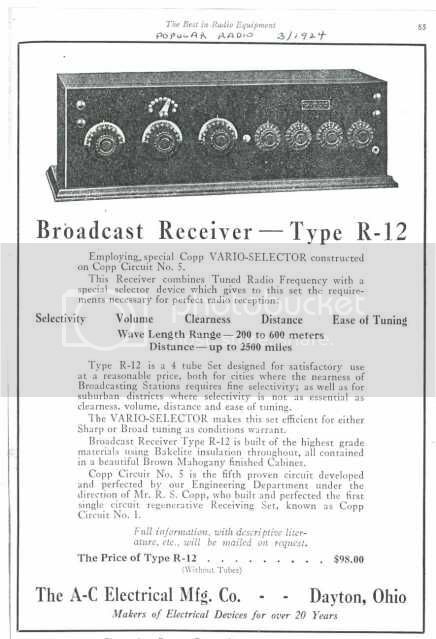 This one dates from early 1924 - another nice catch at Rochester of bygone days. I'm glad I got it when I did even I though I hemmed and hawed at the time thinking they weren't hard to find and had to be talked into it. Last edited by Merrill Bancroft on Nov Mon 23, 2009 9:21 pm, edited 1 time in total. Has anyone ever seen this set? The photo is on ebay now. Radio Laboratory & Manufacturing Company located at 215 Court Street, Los Angeles. Nice WE horn, don't recognize the loop. Set is probably a Super-het. If that's a power supply it's sitting on is sure seems to be over kill. Here is a Pathe, as found, that I picked up this weekend. I don't know how obscure it is but there does not appear to be much information available on it. Is that the same metal nameplate they used on their cone speakers ?? Might have a couple of "glass bottle", lead/acid "B" batteries plus a lead/acid "A" battery in there?. I don't know about the nameplate, I do not have a Pathe speaker to compare it to. Here is another old one in as found condition. A Northern Electric R4 with peanut tubes. I stole this at a local public auction. I was the only bidder. Thats the way to get them Ed! Merrill, do you think that set was pre "Day-fan"? The information on the tag, seems to imply that. 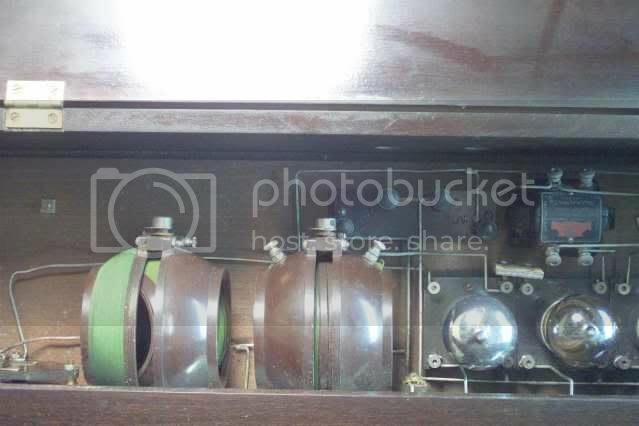 Ed, I think Grid Leak is right, similar nameplate as on the early Pathe cone speakers. Do you have an auction number or link for this photo? for new additions to my Radio Girls collection.